Aquafine watercolour paper is aimed at beginners and students as well as professional artists preferring to work in mainly 'dry' watercolour painting techniques. Its weight of 300gsm offers good water absorb-ability and the surface is fairly hard, making it easily erasable and suitable for masking fluid without stretching. The paper has a smooth (hot pressed) surface which is the flattest surface of all watercolour papers in the Aquafine range, making it a very versatile paper popular for watercolour and line wash work. This pad is gummed on one side (left hand side) to allow you to easily remove pages from the pad if required. Jumbo pad (50 Sheets) 300g/m (140 lb) acid free watercolour paper smooth surface, landscape format. Showing 3 of our total 5 reviews, with an average rating of 5 stars. 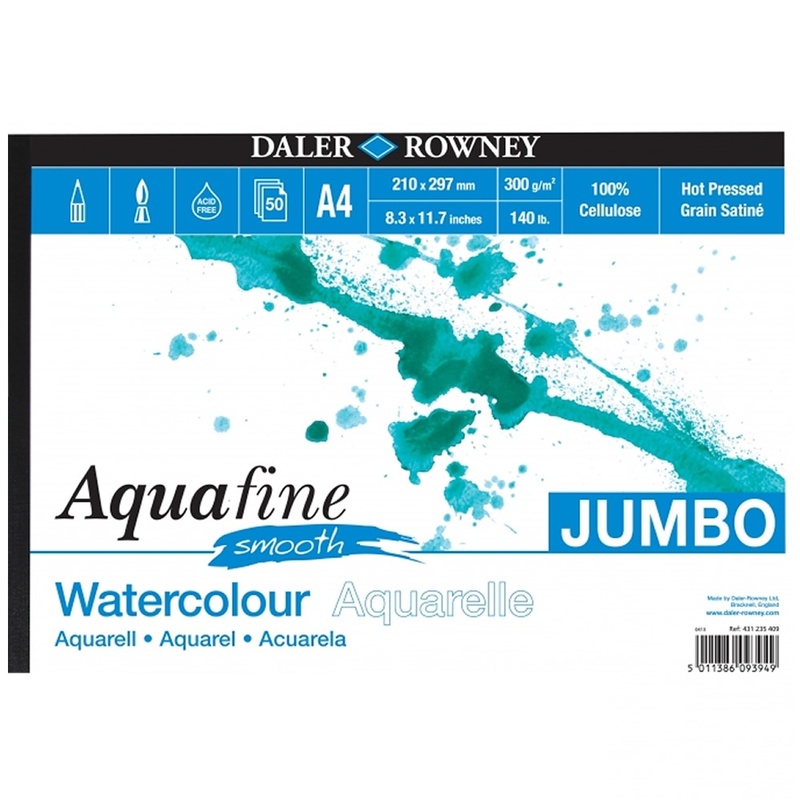 Read all 5 reviews for Daler Rowney Aquafine Smooth Watercolour Jumbo Pad A4 . Brilliant, quality and value smooth watercolour pad. Lovely paper and excellent value especially as I am just starting out so need to practice lots. I love this never ending water colour pad. It is heavy for the work I intend to use it for. Just perfect weight, texture and colour. Amazing price too! Picked up two of these. They are worth every penny.